CAMBRIDGE — Tortoise is a band of few words. That’s true of its latest album, “The Catastrophist,” which is its first with traditional lead vocals on two songs. It was also the case for its set at the Sinclair Tuesday night. Save a quick reference to the Illinois primary happening that evening, no words were spoken from the stage. There’s a monolithic sheen to the Chicago band’s highly respected nine-album output. There’s no frontman. There are few cleanly hewn melodies riding atop those often-dense soundscapes, which find room for two vibraphones in addition to multiple drummers, both acoustic and electronic. There’s no guitar hero (or even vibraphone hero). 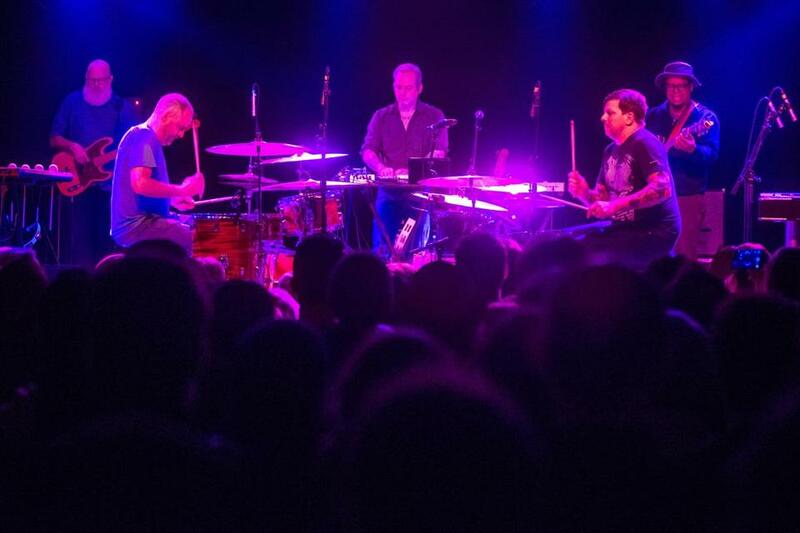 Scan the credits — each of Tortoise’s five members seems to play just about every instrument. So a show is a chance to demystify this music, which even in its latest incarnations can instantly summon a certain moment of 1990s-era experimentation while still sounding utterly original. It’s a pleasure to see these musicians move around the stage and bear witness that, for instance, Dan Bitney is a very good drummer and more than competent on vibes. John McEntire is an omni-capable utility man, filling in sonic gaps with synthesized drones and simple keyboard riffs when not taking the drum stool. John Herndon is the most technically accomplished drummer, though his duos with Bitney ignited the show’s most propulsive moments. On “Monica,” Jeff Parker’s easily loping guitar figure and Doug McCombs’s muscular bassline seemed in service to those interlocking beats. “Prepare Your Coffin” had some slightly flashier guitar licks, but it was clear that Tortoise creates a more-than-the-sum-of-its-parts kind of sound. Though jazz sensibilities are often ascribed to this music, individual virtuosity was never the point on Tuesday. New song “Hot Coffee” was unabashedly groovy, riding on a basic drumbeat and the sparks generated by rubbing together simple guitar, bass, and keyboard gestures, plus well-chosen flexing of dynamic control. There weren’t a ton of obvious high points at this sold-out show — it was all just relentlessly interesting. Tortoise yielded some of its secrets, but remained elusive as ever. Excellent openers E offered loud, layered power-trio rock, shifting the spotlight among guitarist-vocalist Thalia Zedek, drummer Gavin McCarthy, and Jason Sidney Sanford on homemade, scrap-metal guitar. Performing from a console to the left of the soundboard, Mind Over Mirrors (Jaime Fennelly) wove hypnotically repetitive textures from an inventive combination of analog and digital sources.